The Big Island of Hawaii does have its quandaries, among them: Where’s the beach? While there are hundreds of beaches on Oahu, Maui and Kauai, some people leave the Big Island disappointed by the lack of beaches. But there are unique beaches on the Big Island, including pure white sand beaches, green sand beaches, and black sand beaches, too. White sand beaches are made of crushed seashells and corals found mainly on the north end of the island, while black sand beaches are evolved from ground lava rock and mostly found on the southeastern part. Green sand beaches are made from olivine crystals and are very rare. Imagine trying to surf or swim and suddenly … there’s no beach! Also known as White Sands Beach or La’aloa Bay Beach Park, this beach disappears every day when the tide comes in. The periods of high swells wash all of the sand away, only to have it magically return the next day. In December the water comes up higher and there’s hardly a beach at all. When there is a beach, this is the best place for boogie-boarding and volleyball. The sand is crystal white and soft—perfect for tanning and reading a good book. Sandy and rock-strewn, this is one of the few beaches on the island with lifeguards and restrooms. You’ll find it 4.5 miles south of Kailua-Kona. 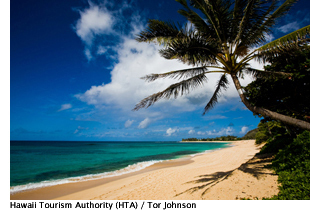 Often voted one of the best beaches in the U.S., Hapuna is the best beach on the Big Island. Here, the waters are warm and welcoming with half a mile of fine white sand stretching almost 200 feet to the water during the summer. Hapuna is great for body surfing and working on that tan. There’s a lifeguard but no snack bar, so make sure you bring your cooler. There is easy access to the beach and full facilities, but get here by 10 a.m. as the parking lot fills up quickly. There’s a nice shady area and a picnic pavilion to relax in if you’re sun-sensitive. Hapuna sits off Hwy. 19, between Mauna Ke’a Beach and Mauna Lani resorts. Pawai Bay is a protected underwater marine preserve. You and the kids will be delighted to swim with thousands of brilliantly-colored tropical fish, endangered sea turtles and wild dolphins amongst the gorgeous coral reef gardens. The best way to get here is by boat. You can hop on board the Body Glove for an all-day cruise that departs from Kona. While you’re there, check out the “Queen’s Bathtub,” near the Captain Cook monument. With its warm, gently swirling water, it’s nature’s own Jacuzzi. This bay is the primo spot for snorkeling and snuba diving (a cross between scuba and snorkeling), as well as whale watching, depending on the season. The friendly Body Glove staff serves up tropical fruits, snacks, sodas and juices, and there’s a no-host bar. Excellent photo ops. (800) 551-8911 or www.bodyglovehawaii.com. Pawai Bay is half a mile north of Old Kona Airport Park. On the east side of the island, Kahena Beach is a black sand beach where clothing is optional. When you come to this beach, leave your inhibitions at the resort! I suggest you take the time to soak it all in, and most of all, hang loose. You’ll discover people of all ages—from babies to the elderly—sans clothing. They usually keep to themselves, although there is a certain type of camaraderie there. You’ll find Kahena Beach between Kapoho and Kalapana, 24 miles south of Hilo. It doesn’t look like much from the road, but once you get in the water, you’re in for a surprise. This is by far the most amazing beach on the Big Island for snorkeling that you’ll ever see. I can’t count how many times I’ve snorkeled there. The amount and variety of tropical fish will amaze you. Kahalu’u Beach is in Kailua-Kona at the south end of Ali’i Drive. It is a dark sand beach with a small sandy area but don’t let that fool you. It’s a prime property with a large, reef-protected snorkeling area. Since it is one of only a few sandy beaches in town, it can get crowded. Fed by a fresh water spring, up to 10 million gallons per day, the waters are almost always calm, but at times it can get a bit choppy in the afternoon. It is filled with colorful corals, rock formations, and over a hundred species of fish. Just south of Magic Sands Beach, Kahalu’u Beach Park is 5.5 miles south of Kailua-Kona on Ali’i Drive. Connie Werner Reichert is CEO of Write Side Up Travel Journalism. She is a member of the ITWPA. Visit her travel writing website at www.authorsden.com/conniewreichert.